You're as safe as houses with us! You may borrow too much based on your present situation. You must make allowance for changes in your circumstances in the future. Be especially careful of loans with payments which increase at a later date. You may spend too much on the purchase price of a home and have insufficient money for your inclusions, improvements or furnishings. There are few things more depressing than having the the home you want in the right area and being unable to afford curtains or light fittings. In extreme cases, the cost of the home can seriously hurt your living standards. Don’t ignore your ‘instincts’. The right home has the right feel, just as the right person has the right feel. No-one should buy a home without having that ‘feeling’. It is easy to grossly underestimate the expense of moving into, and settling into, a new home. When you first move to a home, anything that is going to go wrong, seems to go wrong. Things which have been working well for years will suddenly break. It is almost as if the act of moving in and out displeases the home! Be prepared for a series of irritating and often costly breakdowns and maintenance work. A new hot water service costs hundreds of dollars. Most buyers fail to anticipate these events. Be careful you don’t buy a ‘rogue’ home because you overlook something obvious such as noisy neighbours or smells from factories. You should have at least two inspections at various times – Saturday evenings, early mornings (especially Sunday mornings), and during wet weather if possible. You should meet all the neighbours. “Get to know the home before you move in”. Be suspicious of any home that has had several owners in a short period. You may get tired of looking. You may become desperate and buy something which is ‘reasonable’ rather than something which is suitable. Don’t talk yourself into buying something you don’t like. This is a decision you can spend years regretting. Be careful to buy what feels right, no matter how long it takes. If you become frustrated, it is better to stop looking for a few weeks rather than buy an unsuitable home out of desperation or frustration. With patience, the ‘right’ home is always found. 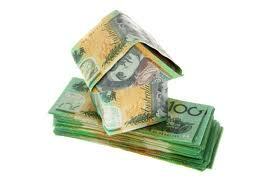 Do not underestimate the continual expense of owning a home e.g. rates, insurance and maintenance costs. Owning a home can cost far more than renting. First home buyers are particularly susceptible to underestimating the running costs of a family home. Very few homes can be ‘maintained’ for under $150 a week. That’s $7,800 extra expense per year! Do not be influenced by the market more than your own situation. Waiting for prices to go up or down is to gamble with your family’s future. If you find the home which feels good and you can afford it, you should rarely let market conditions become a major influencing factor. Buy within your limits, but don’t go too far below what you can afford. You may spend several years wishing you had paid a bit extra for a better home. If you can’t find a home to suit you, consider a cheaper area. Sometimes you can buy exactly what you want in a neighbouring suburb. Is an address really that important to you? Do not buy on price more than on emotion. Thehome itself is more important than the price, provided it is within your price range. Somepeople see the home they really want and if they can’t have a big discount they refuse to buy. This is often a big mistake which you may regret bitterly in the future. You may be tempted to make no decision. You may look for months and years. While you waste money in rent, the prices may rise and you will be left behind. Do not be too demanding and unrealistic. Be pragmatic. Realise that buying something is better than buying nothing. Home ownership is too important to risk a long delay. Do not allow your relatives or your friends to make the major decision instead of just giving you advice and opinions. Relatives and friends do not have the same emotions as you. Friends mean well, but it is unfair to pass the final decision to anyone other than the people who will live in the home. Sometimes it is best to buy a home and inform your friends once the sale is completed. It is important to hire ethical, competent and independent paid professionals to check a home. Be aware that most professional inspectors are trained to find faults. Look at major faults. Do not let the minor faults trouble you too much. Poor guttering is much less of a concern than poor foundations! Agents represent the sellers. Everything they say should be verified, not because the agents will necessarily mislead you, but simply because the agents do not have to live in the property, you do. Agents want to make sales. You want to find the right home. Some agents will attempt to sell you a home which is wrong for you. Don’t be afraid to question the agents. Don’t go to auctions, you will only get your heart broken and your wallet walloped! There is far too much deception with auctions. 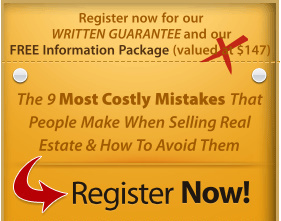 Inexperienced buyers should avoid auctions. Source: ’14 Common Mistakes made by Home Buyers’ by the Jenman Group. Reproduced above with permission from the Jenman Group. 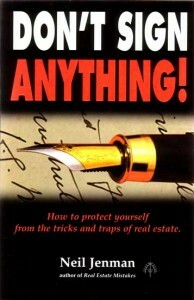 Purchase Neil Jenman’s book ‘Don’t Sign Anything’ for more details from Bernie’s Bookshop. 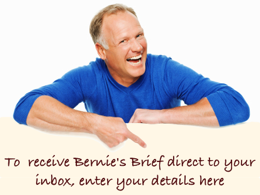 Welcome to Bernie Kroczek Real Estate. Get Me Working For YOU! Book your FREE Consultation NOW! Wishing you a very Merry Christmas!